In the last few posts we've been talking about how a sacred experience of nature can edge us, particularly liberal and progressive Christians, back toward enchantment. As I noted in my last post, given that liberals seem to experience nature as sacred and holy, liberals, at least on an emotional level, embrace a sacramental ontology, an enchanted world "charged with the grandeur of God." And while we're on this subject, we really should visit with the elves and hobbits before moving on. Last summer I blogged through J.R.R. Tolkien's famous essay "On Fairy Stories." Of particular relevance for these reflections are the first three posts from my "The Theology of Faërie" series: "The Enchantment of the Inklings," "The Elvish Art and Desiring Dragons," and "The Wonder of Things." Read those posts to see how Tolkien, and the other Inklings, used fairy stories to help us edge back toward enchantment. But if you don't have the time to read those posts, just note how the sacramental ontology of Catholicism (Tolkien was a devout Catholic) is observed in The Hobbit and The Lord of the Rings, in the enchantments we experience among the elves and hobbits. And these are different sorts of enchantments. The elves are magical. The hobbits are not magical, but they are enchanted. The enchantment of the hobbits are the enchantments of home and simple joys. Love for the Shire. Friendship. Food, drink, and song. And a good pipe. Common things, but enchanted things. The hobbits are less magical than the elves but more enchanted than Men. 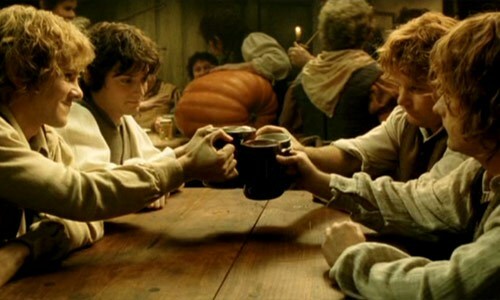 This makes the hobbits perfect metaphors for how we edge back toward enchantment. We don't reach for the magic of the elves but for the enchantments of the Shire. And the the enchantments of the Shire are harmony with nature, domestic life and the daily magic of friendship and good food.